What Do Golden Eggs Do in Monster Hunter World? Learn what you can do with Golden Eggs and whether to sell them or keep them in Monster Hunter World. You’ll be constantly discovering new and unusual things as you play through Monster Hunter World, and one item which might leave you asking, “What does it do?” is the humble Golden Egg. You’ll receive the Golden Egg as a reward for completing certain quests in the game, and it’s up to you whether you want to sell or keep them. 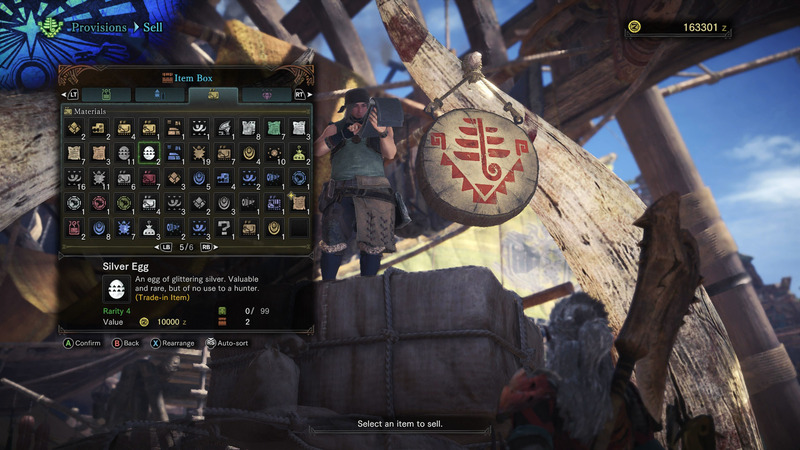 The Golden Egg is one of the many trade-in items that can be earned in Monster Hunter World. These items’ sole purpose is to be sold for a tidy profit. Unlike the Tailraider Voucher or the Silver Wyverian Print, the Golden Egg cannot be used to create a unique piece of armor, used as a weapon upgrade, or consumed at the Melding Pot. The only thing you can do with a Golden Egg is sell it. There’s no sense in holding onto the Golden Egg, but you can keep it in reserve if you like, just in case you’re running low on funds and need a slight bump. However, if you do want to sell the Golden Egg, you will need to go to Astera and speak with the Provisions vendor. You can find the Golden Egg by selecting the Sell option, and then choosing to sell something “From Item Box”. Use the triggers to scroll to the sleeping dragon symbol, and then the bumpers to navigate through the pages. The Golden Egg should be located on one of the last pages (near any Steel Eggs or Silver Eggs if you've got them). The value of the Golden Egg should be roughly 20,000 Zenny, which might get you a couple of upgrades or perhaps a shiny new piece of armor. When you manage to unlock the High Rank content, you’ll find that the quests begin rewarding you with valuable items, most of which are used to upgrade your gear. However, a few rewards will be “Trade-In Items”, much like the Golden Eggs, that only exist to make you more money. Sell what you want, and save the rest of a rainy day! Check out our Monster Hunter World guide for more insight into the other mechanics and features in the game.